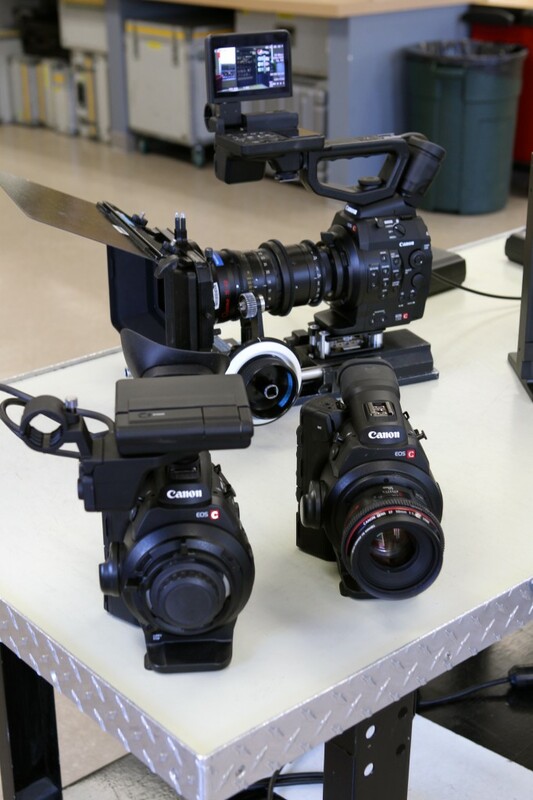 Coming off of our hugely successful Pub Night here at Rule Boston Camera last Thursday night, I finally have a few minutes to sit down and pass along my initial observations of the Canon C300 and C300PL cameras. 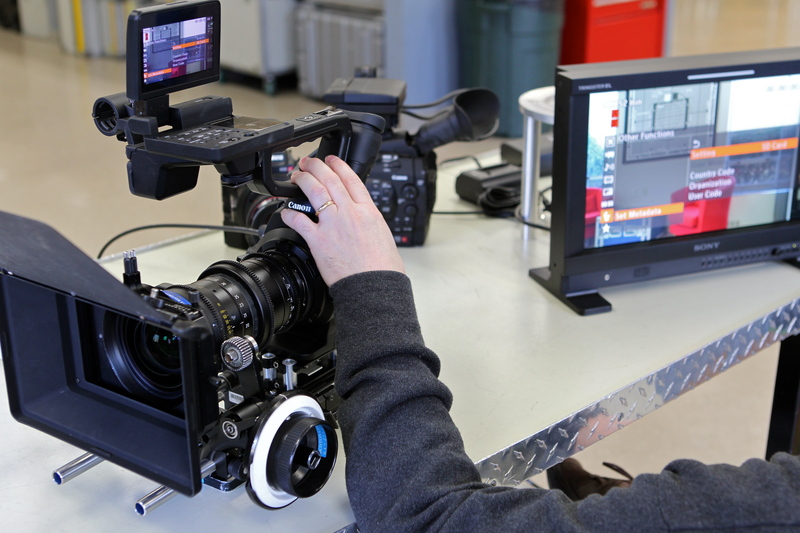 When I first got to handle the C300 in November, I did not know if a modular design would be better than a single integrated design. The first thing that comes to mind is that the bits and pieces, or modules as I have been calling them, could easily get misplaced if you were spending too much time setting up and breaking down “stuff” for any given shot. 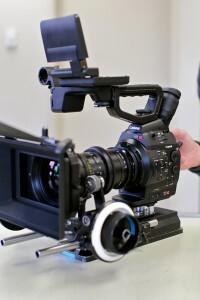 I have started to reconsider this opinion thinking that different users and different productions might configure the camera to satisfy the shooting style rather than to satisfy the shot. That said, I tried adding some modules onto the camera and throwing it into a camera bag to see how much stuff could be left on without much fuss. It is a bit tall rather than long (depending on the lens) but with a simple tripod plate screwed onto the camera I found that I could move from tripod to handheld to and then to camera bag just by removing the LCD module. I know that we will see lots of 3rd party accessories shortly so stay tuned! In its most stripped down state, you simply pop in a Canon 955 battery, side grip and a lens and you can shoot using the small EVF and no microphone. 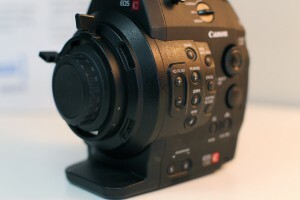 From there you can attach the LCD module which also gives you 2 XLR connections and media playback controls. There is a shotgun mic holder on this module as well. The module connects via two 20 pin limo connectors that appear to be totally unique. These connectors provide signals for the LCD and controls as well as to the XLR mic/line audio inputs. This is a small 1/8th mini mic connector on the camera body as well but I suspect that may be limited in quality. Additionally Canon provides a handle which can be used with or without the LCD module. 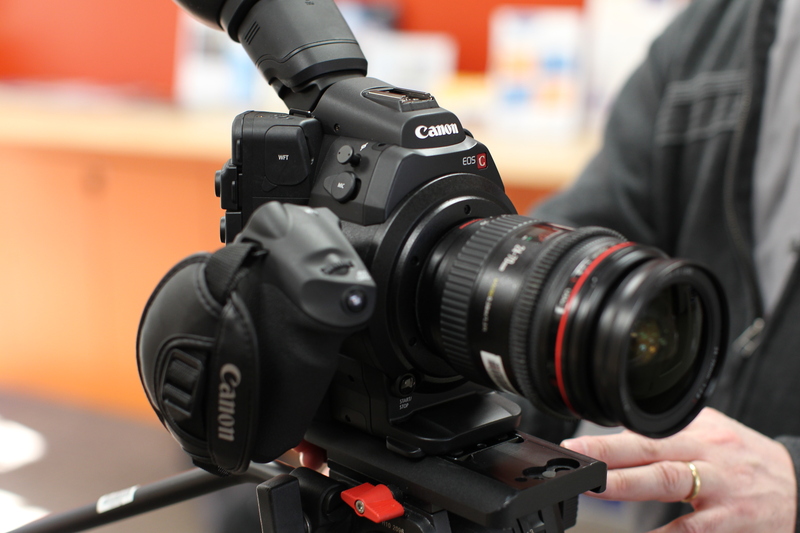 Very simply, when you purchase or rent the Canon C300 you have to commit to either the EF lens mount version, called the C300, OR you have to commit to the PL lens mount version called the C300PL. Canon deliberated this for quite some time before concluding that a super-accurate and mechanically sound lens mount was more important and beneficial to the user than in interchangeable adapter solution. I agree with this when you consider that sacrificing tight design for flexibility and a broader audience may reduce the camera’s performance. Factoids on paper sometimes appear more powerful and important than they actually are. Since 100 is a larger number than 35, 100 must be “better”, right? Of course, the word “better” has no context and is very misleading. This was often first sentence in a much more in-depth video signal compression discussion (but I digress). The Canon 4K imager does a fantastic job delivering a full 1920×1080 resolution for the Red and Blue components and actually delivers 2 channels of 1920×1080 Green in such a way to minimize moire and retain a super sampled luminance signal. This full 4:4:4 signal is offered to the signal processing engine. Ultimately from there the signal is fed to both the HDSDI and HDMI outputs as well as to the compression engine packaged as 8-bit. 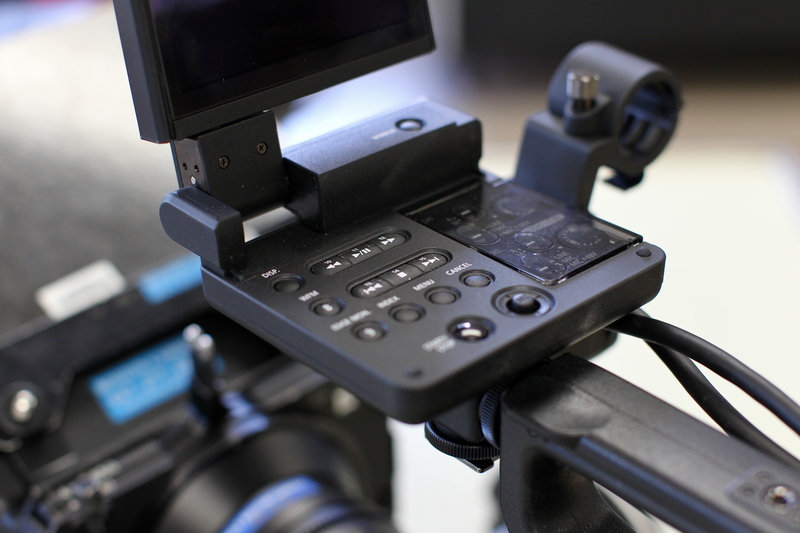 In-camera recording to CF cards is up to 50Mbits/sec 4:2:2 wrapped in MXF. Some people are concerned that 8-bit is not as good a 10-bit and, in a vacuum, this is true. Most of the current in-camera recorders out there encode an 8-bit signal of some type. Some external records can be setup to record a 10bit signal but it depends on the CODEC. While demoing the C300 to a large group at WGBH the other day it was wisely pointed out that HDCAM is also an 8-bit recording format and HDCAM is the delivery format of choice for what we see every day for PBS broadcasting. Like most things, you be the judge of what is objectionable and what is water cooler speculation. I will devote a future blog entry to the C300 menu structure but I can say that the interface was very intuitive and familiar. The menu can be superimposed on the EVF, the LCD or the external outputs. In the case of the external connectors you do not get all superimposed info such as WFM, VECT or some other items. There is also a very handy rear display below the EVF that gives you access to ISO/Gain, White Balance, and shutter angle. I found this to be the place where I would quickly choose the Function button and toggle between and change these core settings. At tonight’s Pub Night, we’ll be introducing an exciting new Electronic Viewfinder made by TV Logic and distributed by Alphatron that will be available at NAB 2012. You can see the basic specs below, and more information will be released monthly. 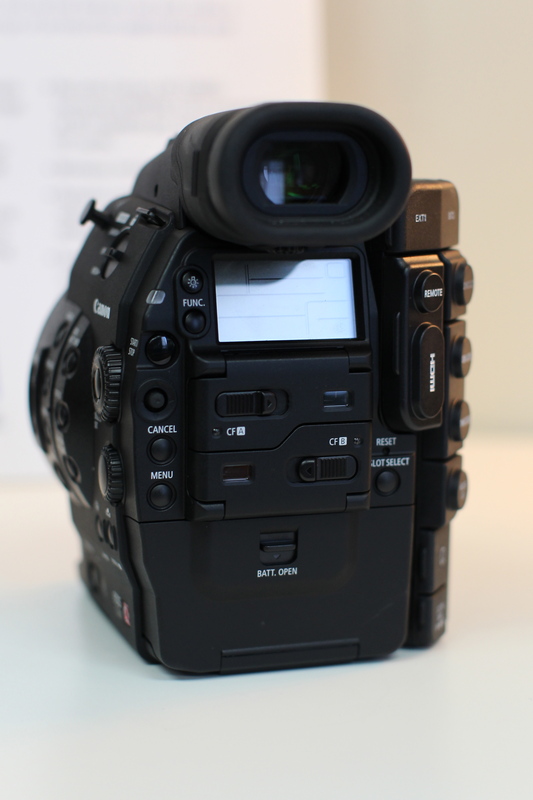 EVF 035W-3G Electronic Viewfinder, available Spring 2012. Made by TV Logic and distributed by Alphatron. Stats: 3.5” Display 960×640 HD-SDI loop through HDMI in/out 1080P Headphone Jack Focus Assist Each month between now and then we will release updates with new product features. TV Logic and Alphatron came up with the idea for the new EVF at last year’s NAB and have spent this year working together to develop and fine-tune it. Rene van der Reiden of Alphatron describes the relationship between Alphatron and TV Logic as, “a good combination with many factors, so this combination hopefully will be very successful in the time to come.” We encourage you to ask us questions about this new product! We’ll channel them to Alphatron in order to get answers and to let them know what kind of feedback we’re hearing from our customers about the product so far. The EVF035W-3G Viewfinder will not be available through TV Logic or Alphatron online. The product will only be available through product resellers. The list of resellers has not been announced yet, but Rule Boston Camera is one of them, and we look forward to answering your questions and telling you more about the viewfinder. The EVF will list for a price of $1,395 which is also Minimum Advertised Price. As a company that has had good experiences with TV Logic products in the past, we agree with Rene’s statement that, ‘what is important is how they handle problems and how they support you. We have been working with them for the last 4 years and have an excellent relationship not only business to business, but person to person. Here, we are very excited because we know a little more than everyone else does and it will be a brilliant product, I’m sure. It’s [a company to customer] win-win.’ -Michelle Brooks, Inside Sales, brooks@rule.com If you have further questions, please contact either our Sales Team here at Rule Boston Camera or myself at 617-277-2200 or email us at RuleSales@rule.com.